If I've counted correctly, this is day 8 - well, actually 9, because it's after midnight. 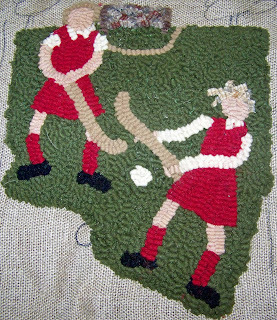 I didn't blog last night because I was way too tired, but I finished hooking the field hockey grass and moved on to the swimming pool. I had to dye wool for the pool water. I had a jacket lining that was a shiny blue gray that would have made a great water color, but the color didn't bleed out of it. So, I used a large crockpot and simmered some white wool with a strip of navy blue and another strip of dark green (the wool used for the two swim suits). After the color bleeding was done, or at least done enough to get the colors I wanted, I threw in some pink wool - the pink I've been using for faces, arms, and legs. 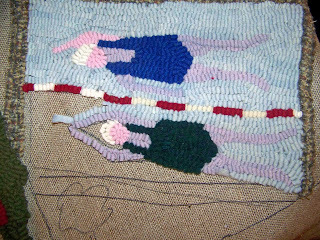 I figured that most of the body parts of the swimmers should be under water, so I wanted the pink wool to be overdyed with the water color. I think it looks like they are under water. I'll probably get the pool finished tomorrow, then only a horse and rider left before I have to go back and complete each scene, then do background.